MABLETON, GA — About 100 students –overwhelmingly Latinos– walked out of classes this afternoon at Pebblebrook High School in this Atlanta suburb. “As undocumented youth we can no longer be afraid of those who stand against us, instead we need show them we will fight back. We need to take a stand because if we do not do it no one else will” said Dulce Guerrero, a graduating senior. Guerrero was one of several students who addressed a rally in front of the school, some undocumented, others who were born here in the United States but have immigrant parents and siblings who are undocumented and live every day with the fear that when they come home from school, their loved ones may have been snatched from them. Guerrero explained that May 17 had been chosen for the walkout both as a protest against Georgia Gov. Nathan Deal having signed HB 87 into law on Friday the 13th, four days earlier, but also because it was the anniversary of the 1954 Supreme Court ruling that “separate but equal” was a myth, “separate” when it came to whites and Blacks in the United States was inherently unequal. In addition to McDonald, two African-American students also spoke to express their solidarity and underline the bond between the struggles by Blacks and Latinos against white supremacy. There was no attempt by the school administration to break up the protest; police presence was very light and the officers limited themselves largely to asking reporters to stay on the sidewalk, off school grounds. 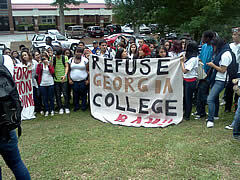 There are an estimated 70,000 college age and younger students in Georgia who lack immigrant status. On a national scale, some two million young people find themselves in the same situation. The next scheduled protest action for immigrants rights in Georgia is this coming Sunday’s Women’s Walk in Defense of Immigrant Families aimed especially against the “secure communities” Obama administration program. This initiative, while supposedly targeting “the worst of the worst” criminals for deportation, instead has broken up untold tens of thousands of families by deporting people who have only minor violations, even as little as a traffic ticket, and in 30% of the cases, no police or criminal record at all. Both immigrant and other women and their children have been asked to gather for that action at Centennial Olympic Park at 10 AM, on Sunday May 22 wearing white tops or shirts. 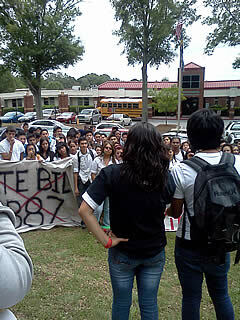 The student leaders emphasized the importance of the July 1 “Day of Non-Compliance” against HB 87 when the entire community is urged to not go to work nor schools nor do any shopping nor patronize any restaurants or entertainment venues.